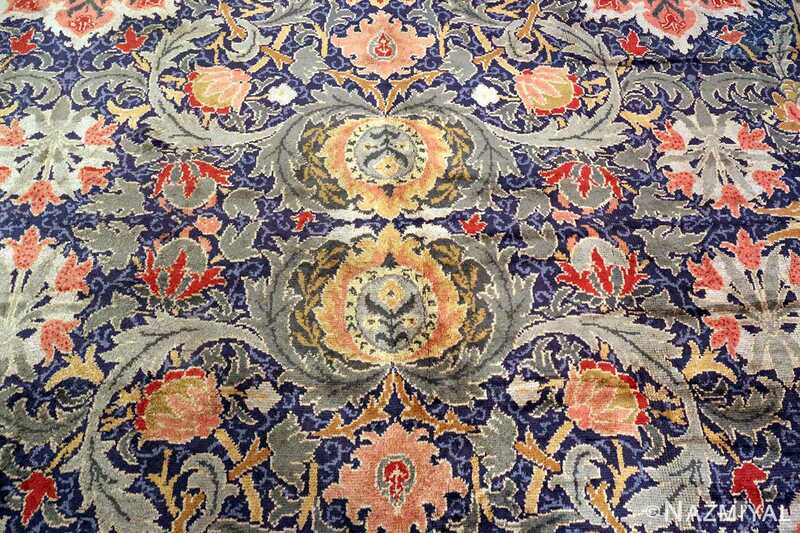 Magnificent and Rare Large Oversized Antique Arts and Crafts William Morris Rug, Country Of Origin / Rug Type: Irish Rug, Circa Date: Late 19th century – This huge oversized rug may at first appear to appeal to the design sensibilities of traditional Persian rug makers, but this antique rug is the product of the great arts and crafts designers of the late 19th century. 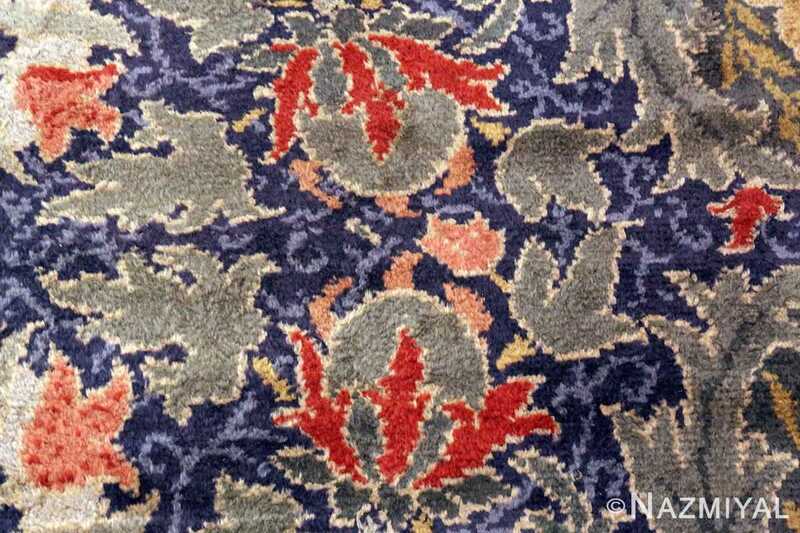 This arts and crafts rug was produced by William Morris, who was a textile designer, novelist, poet, social activist, and translator in Britain who was associated with the arts and crafts movement. 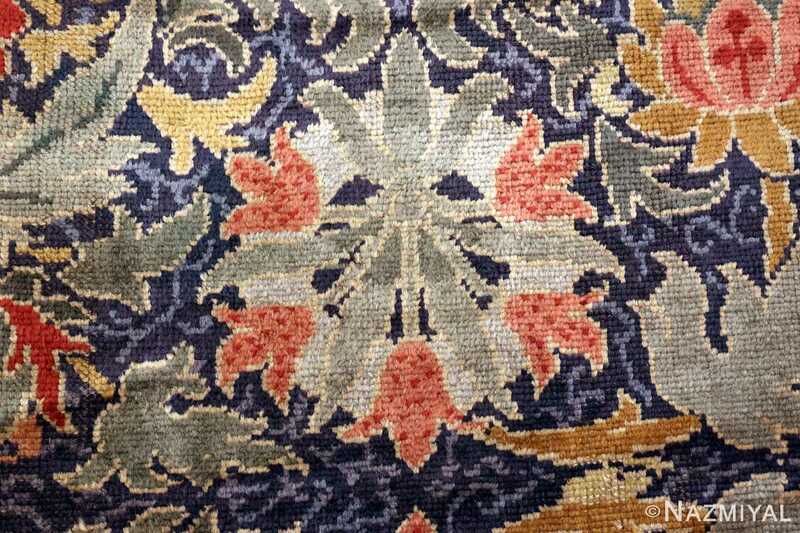 The work of William Morris played a major role in the revival of traditional British textile arts. The Persian influence of the design of the William Morris rug is apparent to those who know where to look. 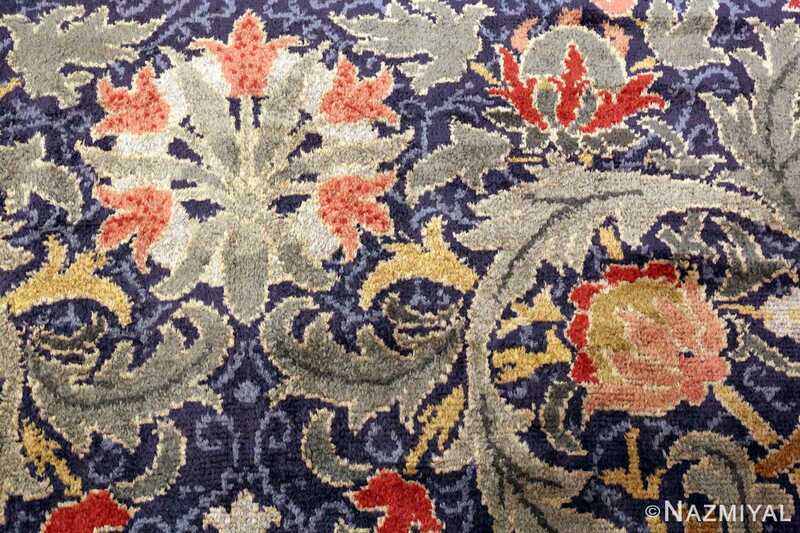 It uses an all over design with a formal main border. 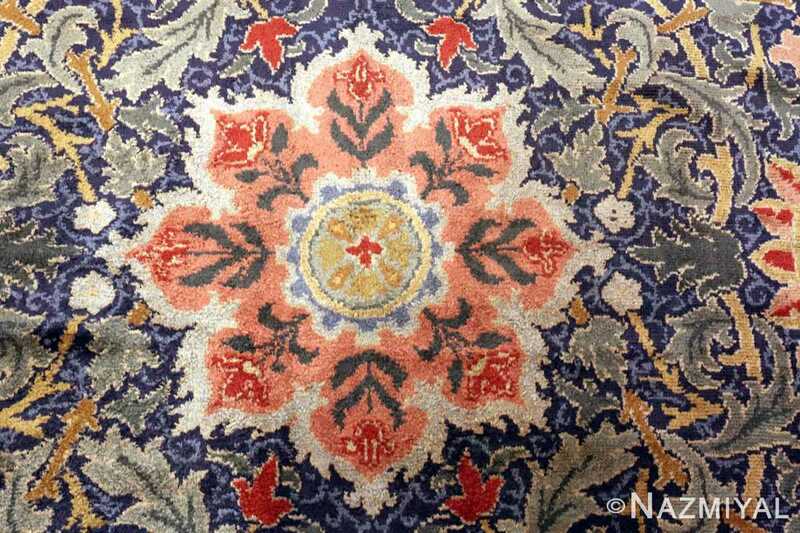 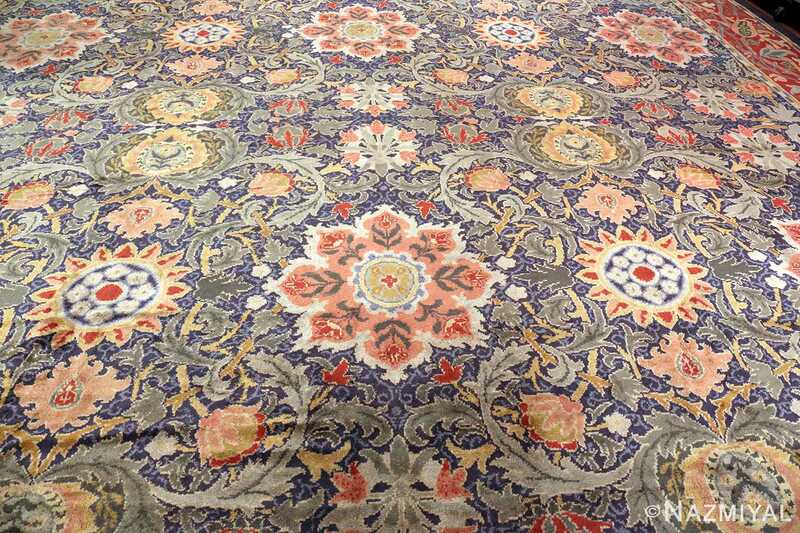 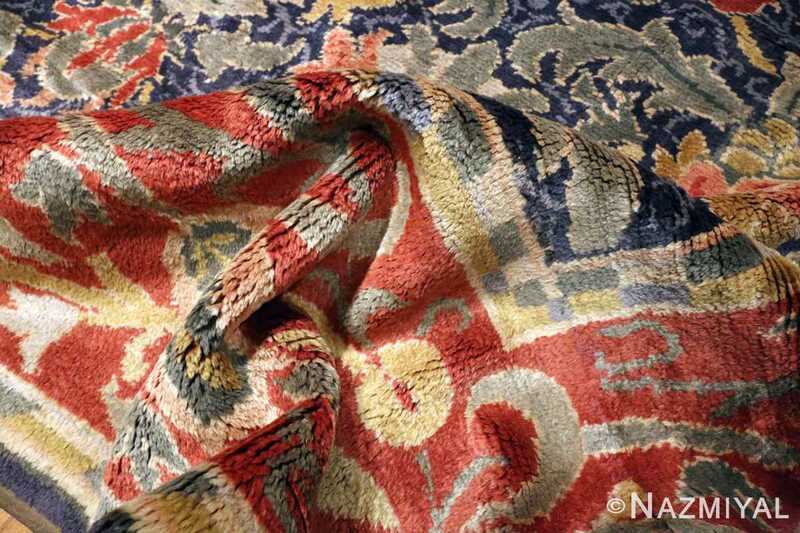 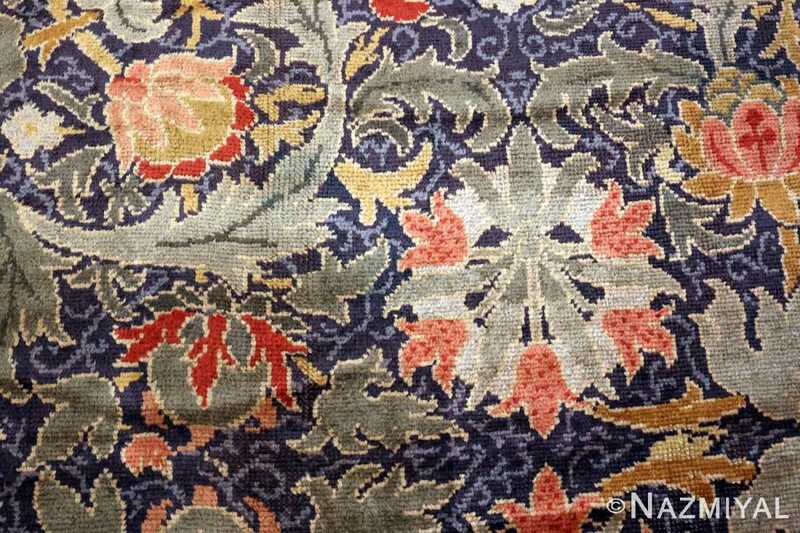 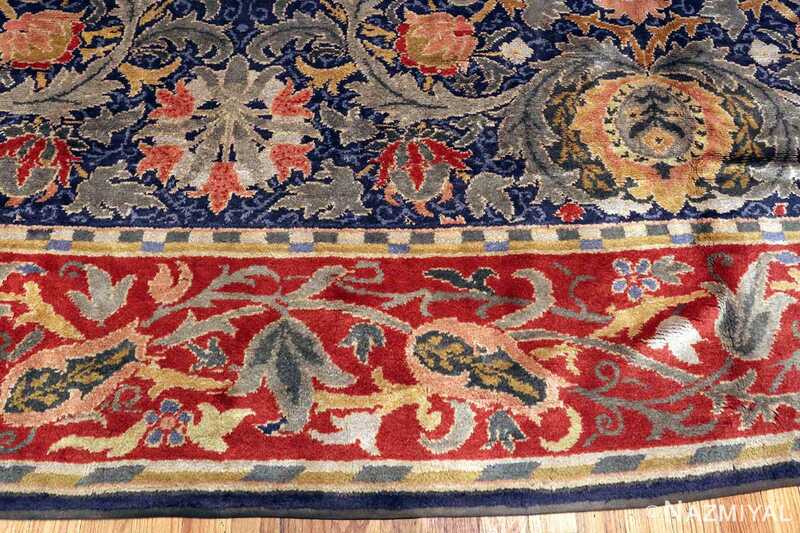 The contrasting blue and red backgrounds of the rug and border highlight the motifs. 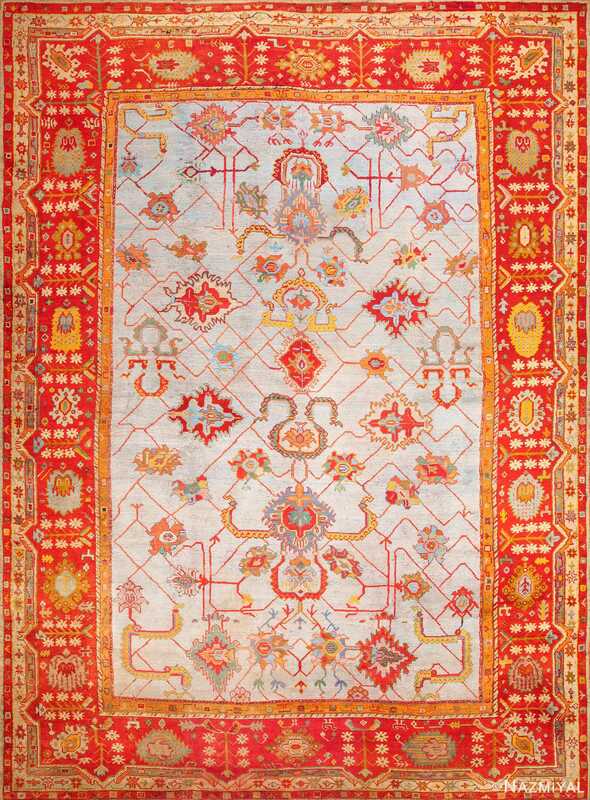 Regularly spaced red floral motifs tie the design of the field in with the main border. This gives the beautiful Celtic rug a sense of balance in terms of color and scale. 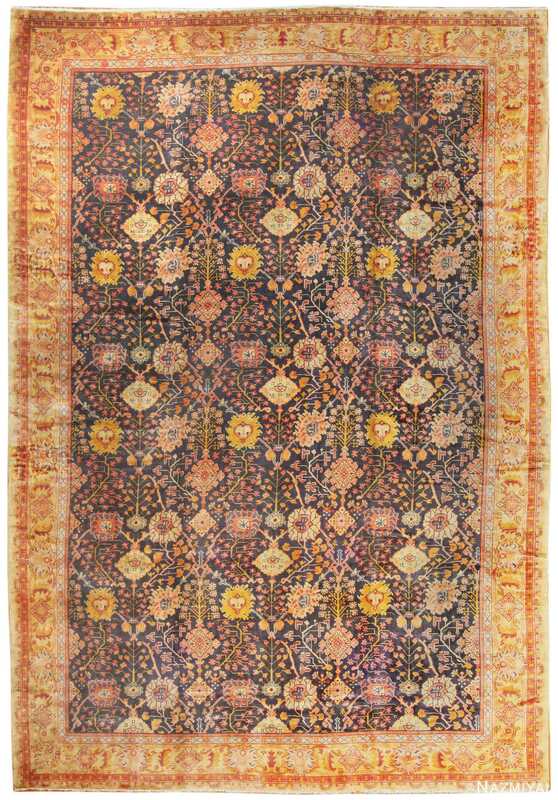 This Irish rug uses an array of colors and tones to portray shading and fine detail in the execution of the motifs. 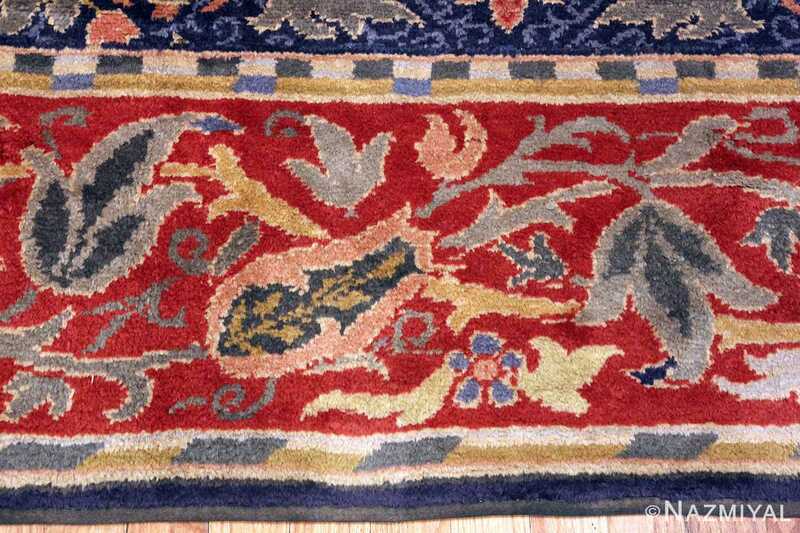 It uses almost every color imaginable including yellow, salmon, reds, green, blue and ivories in many different hues and shades. 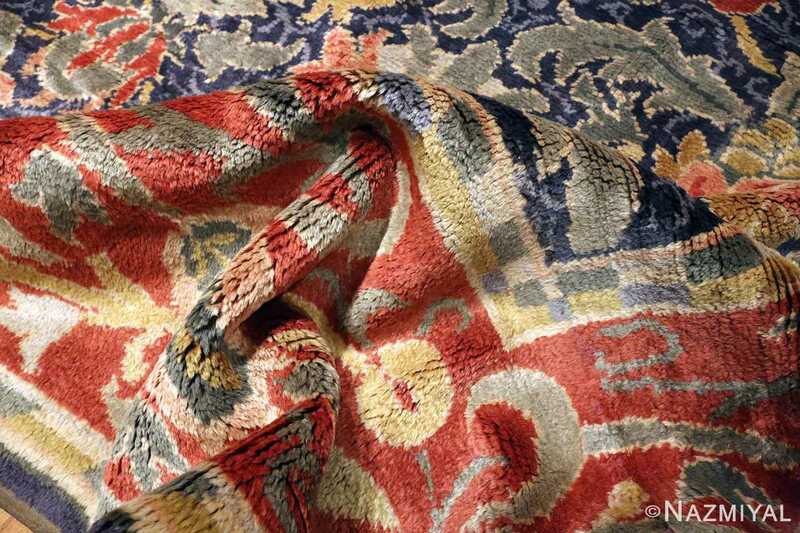 But all these colors work beautifully off of and with each other. 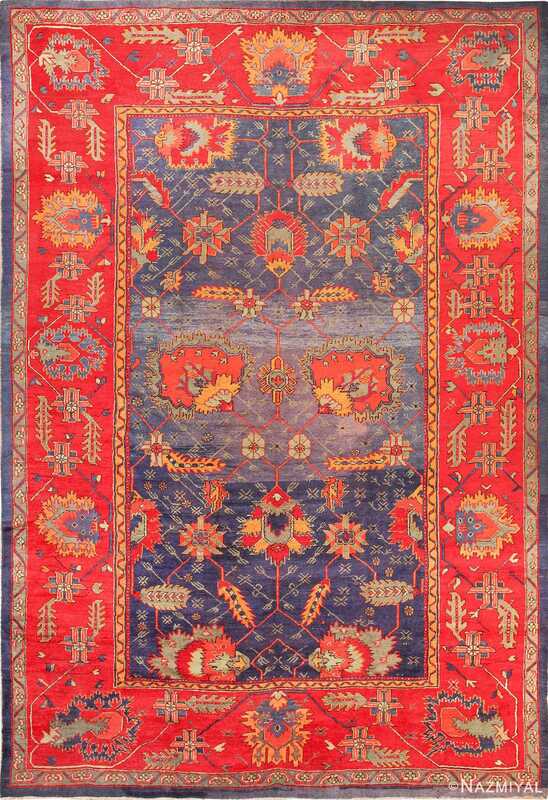 None of them compete for attention as they all seem to working together to elevate the overall artistic impact of this truly breathtaking and rare example. This William Morris rug has no truly defined central focal point. For those of us who feel the need to center everything, this makes it so much easier for decorating a room around. The intricacy of the design and its exquisite use of detail and color give this rug a timeless almost Victorian appeal, that would make it an excellent addition to a formal setting in the home or office.